If you are looking for a review of all the best mini ovens in the UK, you have found the right place. We review all the latest and best mini oven models on the market, to give you peace of mind that you will be choosing the right product for your home. Below, in the table, the mini oven reviews start with the most highly rated first, then descend accordingly. For people who are in a hurry, you can use the table. For people who want a more in-depth review, you can scroll further down the page, where we provide all the pro's and con's for each. The Dualit Mini Oven is a 18L capacity convection oven that is perfect for small spaces or as an additional eye-level oven in a busy kitchen. It features a stainless steel construction with a curved back to provide adequate room for large circular dishes. This is a definite must-have for your kitchen considering the inclusion of versatile cooking functions and alongside a fast 3-minute heat-up time. It rises from zero to 1800 in just 120 seconds making it an ideal fast cooking accessory. It has a heavy duty double glazed door with a large viewing window to give you maximum control when cooking. The Dualit mini oven is a versatile accessory that allows you to cook different dishes at the same time. The different settings include; defrost, bake, grill and convection cooking. Its internal dimensions are 30cm by 25cm by 17cm and the external measures 42cm by 36cm by 25cm. The power rating and weight of the Dualit Mini Oven are 1.3KW and 7.0KG respectively. Among the accessories that come with the package include a 9” pizza pan, wire shelf and a grill pan. The Klarstein Omnichef 45B is a multifunctional mini oven with a 2000W power rating and 45L volume capacity. It has special features and functions that make it a multifunctional mini oven for baking, roasting, cooking, and grilling. It has four heating elements and you can use upper heat, lower heat or a combination of both. It also features the convection and rotisserie functions for even distribution of heat when cooking chicken and kebab skewers. The built-in timer and thermostat make the Klarstein Omnichef 45B one of the most convenient mini ovens available. You can adjust the time for up to 60 minutes and vary the temperature for up to 230°C depending on the food you are preparing. The accessories included in the package are two brackets for easy removal, a grill rack, a baking tray and spit. The Klarstein Omnichef 30 2G oven can be an ideal solution for your cooking needs. The 1500 watt oven is very powerful and helps for quick food preparation. Talk about convenience. There are 5 different cooking functions to match your everyday cooking needs. The thermostat ensures precise temperature control while cooking. Hence, the oven meets all culinary needs even at varying cooking temperatures. The 30 2G comes with a timer function to keep track of the time and temperature. So the end product that you get is always perfect. The Andrew James mini oven is an all-in-one accessory for a company that considers itself the market leader in this segment. It features two independently controlled hotplates with power ratings of 1000W and 700W for frying, boiling, frying and reheating. The mini oven itself has a 33L volume capacity and a 1300W power rating that ensures quick heating to a maximum of 2300c. Get to save a lot of time when using this mini oven by using both the integrated hotplates and the oven compartment simultaneously. This mini oven is ideal for studio apartments, homes, offices, caravans, student accommodations and camping homes. The accessories included in the package are a chrome-plated grill rack, an enameled non-stick baking tray, and a detachable handle for removing hot trays. The Russell Hobbs is multi cooker. It is a marriage of oven and two hotplates. The cooker supports both independent and simultaneous hotplates operation. Both of these 1000 watt and 750 watt hotplates can be used to grill, roast, bake, fry or boil. But, the hotplates and oven cannot be operated simultaneously. The 30 litres capacity oven can process various recipes. The thermostat regulates cooking temperature from 60 degree Celsius to 240 degree Celsius. Simplifying your job are other bells and whistles. The 120 minute timer along with auto shut-off and ready bell all aid in easing your cooking process. The cooker also comes with a 2 years warranty which is extendable to 3 years when registered online. This is a compact yet powerful electrical mini oven from Oypla that is ideal for households where kitchen space is limited. These include caravans, student accommodations, studio apartments and offices. It features a 26L capacity and it uses 4 heating elements powered by a 1500W-2900W electrical power. It also features two independently powered hotplates rated at 800W and 600W that are ideal for frying/browning and boiling respectively. 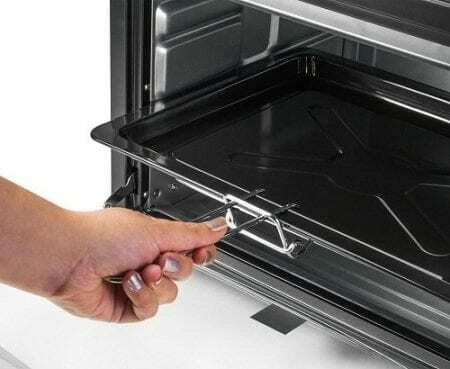 This mini oven is becoming one of the UK’s favorites because of its excellent design and conformity to UK British manufacturing and safety standards. It comes with an integrated power indicator and oven heat protection that serves to keep all fire-related hazards at bay. With the highly rated oven and hotplate heating elements, this mini oven is capable of heating your food from 1000C to 2500C. It measures 50cm by 32cm by 48.5cm and has a non-stick oven coating. The accessories that come with this mini oven include a baking tray, a wire rack and a pair of tongs. The Andrew James mini oven is a versatile compact oven that is designed to make your life simple in a small spaced kitchen. It intuitive dials with self-explanatory symbols to help you control the temperature, time and the five cooking functions of the oven.The temperature dial allows you to adjust the heat settings up to 2300C while the timer allows you to preset the oven’s cooking time for up to 60 minutes. As far as our review is concerned, this model ranks the second among the best single ovens in terms of versatility. This is because you can use it to prepare anything that you would when using a conventional oven. Furthermore, you get to save a lot of time and money on your energy bills. This mini oven measures 45cm by 29cm by 29cm in length, width and height respectively. The interior space is ideal for 11” pizzas and a small chicken. It comes with a chrome plated grill rack, an enameled baking tray and a detachable handle for removing hot trays. Gauging the temperature is not straightforward and therefore you may either undercook or overcook your food. However, you can master the use over time. The Smart Oven Pro with element IQ Sage BOV820BSS is not like the ordinary ovens you are used to. This is the countertop oven that has high performance and is also versatile. You can bake, toast, grill and roast your meals in a single unit, fast and efficiently thanks to the convection function that reduces the cooking time. Convection raises hotter air and sinks colder, less dense air to ensure quick heating. There are 10 cooking functions to guide you when using this unit. This includes the Toast 6 slices, Bagel, Bake, Roast, Grill, Pizza, Cookies, and Reheat, Warm and Slow cook. Some foods require slow cooking to develop tasty flavors and that is the reason for the function that provides long cook times at low temperatures. The Smart Element iQ system is responsible for supplying heat intelligently across 5 quartz elements for accurate and steady heat where and when you want to get absolute results. There is also a super-fast 2400W preheat that lets you cook fast. To access the integrated smart functionality, there is an LCD display to help. You can also select from the 10 cooking functions on the LCD display. In addition, it also displays temperature and cooking time in order to easily monitor your cooking. You get to see clearly what is placed in the oven with the interior oven light. This light kindles up automatically when you open the oven door and when the process of cooking elapses. There is an auto shutoff and distinctively controlled button on the oven to end the cooking process. If space is your main concern in the kitchen, then this mini oven from Elgento should be your ideal choice. It is a compact yet versatile oven that complements your kitchen space. However small it may be, it provides the same cooking power that bigger models provide. You can use this in the hostels, holiday homes, smaller kitchens or in the caravan. This mini oven has an adjustable temperature function that ranges from 90 to 230 degree Celsius to allow you to cook your meal to your desired taste. It also uses 2 quartz heating elements that enable fast heating. In addition, there is a 60-minute timer to control the cooking in your absence. At the end of the cooking process, you get a beep sound to alert you when the food is ready. This provides maximum efficiency. You get to cook a variety of meals like baked or grilled food in the mini oven with the 9L capacity. There are additional trays that this mini oven comes with to expand your cooking convenience. They include a bake tray, wire rack and crumb tray. These trays enable you to cook differently every time to get tasty results while keeping your worktops clean and tidy. Whats more, the oven door is transparent with a cool touch handle which enables you to watch your ingredients while they cook. The oven has a stainless steel outer casing with non-slip rubber feet to provide great stability when placed on the work-top. This ensures safety. This is arguably the best budget oven that comes with a rotisserie function. It features a 18L volume capacity and a power rating of 1280W making sure your various cooks are ready within the shortest time. Also, this mini oven has a 6-stage heating selector for rotisserie and a heating element. Unlike most budget mini ovens, this model has a timer that also features an auto-shutoff and bill alert function. This means that you get to say goodbye to overcooked, undercooked and burned food. What is more, the viewing window is a heat-resistant tempered glass which means it is highly insulated. The accessories that come with this mini oven include an aluminized baking pan, a wire rack, rotisserie handle, rotisserie skewer and pan handle. Having looked at all the ten mini ovens with different features and functions, I believe you are better placed to make an informed buying decision the next time you go out to shop for one. More often than not, price differences indicate the difference in performance as well as the number of functions. However, you are advised to always refrain from overstepping your budget line. You can be sure that all the ten mini ovens we have reviewed are excellent in getting the job done. If you don’t mind the premium pricing, the Dualit 89200 Mini Oven with a 18L capacity and 1300W power rating is the best overall mini oven in my estimation. However, if the price is a major issue for you, then I’d recommend the Tower T14012 Mini Oven. Happy buying! A Mini oven is becoming more of a necessity than a luxury for most households as spaces become limited. Since it does everything that a conventional oven can do, it is safe to say that a mini oven is a great space saver. Secondly, it allows you to roast and bake faster than a conventional oven due to the presence of the fan. It is this fan that also makes sure that your meals are evenly cooked. The amount of time you can spend preparing food using a mini oven is smaller compared to the conventional oven. Also, you will notice that the meat roasted in a mini oven is juicier and has a higher yield. This is because it does not shrink a lot during the cooking process. There are a couple of things you need to check before, during and after using an electric mini oven. First and foremost, do not attempt to connect your electric mini oven to an extension plug. There are chances that the extension cord does not have the load capacity to accommodate your mini oven. Therefore, this might result in an overloading situation which poses dangerous fire risks. Also, when using the mini oven, check to see if it is compatible with silicone products. This will save you the risk of blowing up your mini oven prematurely. Some mini ovens get really hot when in use. Although the heat may not be too much to cause serious burns, it is a good safety practice to avoid direct contact with the surface, especially the top of the mini oven when it is turned on. Buying a new mini oven for the first time can be a difficult task. However, that is why we are here, to help make the process as simple as possible. The three main factors that you need to consider when buying an electric mini oven are; the size, the power rating and the number of heating functions. The size will, of course, be determined by the number of people in your family and the size of your kitchen. The more the people you have, the larger the size of a mini oven you will require. Also, you should know that although mini ovens are generally compact-sized, there are those which are smaller than others. As such, choose the most appropriate based on the kitchen’s size. 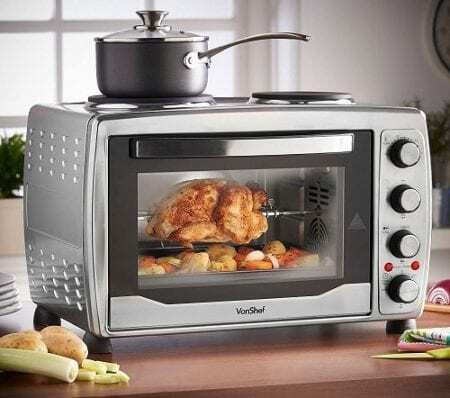 As far as power rating is concerned, the number of watts indicated on the mini oven symbolizes the energy consumption rate and its working efficiency. Highly-rated mini ovens consume more electricity but they get the job done really quickly. Lastly, multi-functional mini ovens are preferable for obvious reasons. They are versatile thus giving you the opportunity to bake, roast, grill, fry and even reheat your meals. They are, however, more expensive than those with fewer functions. Other factors you can consider include the price of the mini-oven, the safety features, and the additional accessories included in the delivery. You can also consider the ease of installation and post-use clean-up. Q: What size of a mini oven is suitable for me? A: The size of a mini oven that is suitable for you depends on the number of people in your family and the size of your kitchen. If you have a relatively large family and a considerable amount of kitchen space, then a mini oven with large dimensions would be perfect for you. Q: How do I know if my mini oven has a rotisserie function or not? A: The manufacturer will indicate on the package all the functions it has.